I've always been impressed by the quality of the sword picutres on Nathan's site here, or posted to SFI in the days before myArmoury.com... I have some self-interest here, since I'm starting a small theatrical props rental business and wanting to set up a webpage, but I think the general sword community would also benefit from an article on how to photograph swords- especially if the option is coming up to start your own gallery here, as was mentioned in an earlier thread. Lighting, positioning... swords can be tricky, as their sometimes ungainly size, their reflective properties, and high contrasts between, say, high polish steel and black leather can make it hard to show them at their best. I know people have done writeups before, I think even Nathan has on SFI a few years back, but could this maybe be added to the 'features' section sometime? Sorry to be asking more of you guys. Just discovered the forums. Nice spellcheck feature, by the way. Funny you should ask for this, as it's been on my mind lately. One of these days I'll flesh out an article on exactly this. Being the perfectionist that I often find myself to be, I'll probably have to scale it down from what I envision it to be. For now, I've put up a page describing the needs for people who are interested in contributing collection photos to myArmoury.com. The page describes How to Prepare One's Photos and is available from the Want to contribute or join our team? link off the home page. There's some tips there, though it's not entirely fleshed out. Let me know if that's at all helpful. Feedback on that quick page will lead to a better article someday. A good start, but I do have other questions- is that just your own impeccable white background, or do you photoshop out the background and then add a slight shadow in photoshop? If it is your background (as I suspect), you do a great job with the lighting, one of the trickiest parts for those of us without a real studio to work with- no shadow problems, everything clear... good job. A few specifics- flash vs. other light sources, swords that don't naturally lie flat (complex hilts)- photograph perpendicular to the axis they lie on or prop somehow, incandescent vs flourescent vs natural lighting? I sometimes also have a problem with reflected light off steel blending in to a white background. I sometimes just use a different color, but this limits my options some in design- my current webpage has a green background, and the red cloth I liked as a background clashes horribly. Shame, since it was pretty, and worked with both shiny metal and black textures. In other words, no composited photo will ever match the realism that nature, itself, will give us. If one has the ability to photograph something on a white background, then by all means do it. No retouched photo that has been silhouetted will ever match the subtle details that nature brings us. So having said that, I photograph my stuff on a large piece of three-quarter inch thick white foamcore as a background and shoot it as to control the natural shadows. Regarding swords that don't lie flat naturally: all swords can be made to lie flat. You simply need to prop them up. I use a goo that photographers use that's similar to those pliable erasers, but have also used stacks of dimes or pennies, small blocks of wood, etc. Generally, this stuff can be hidden under the hilt, but occasionally you'll need to retouch out the props if you're unable to hide 'em naturally. In terms of controlling the reflected light: you can really define the reflections by your surrounding. I have stands that I use with clip-on cards of matte board that I can use to control what's being reflected from the steel. Use white or black cards to get the effect you want. Use a colored card and then change the color later in retouching if you want even more control. But lately, I have to be honest: I don't even drag my lights out any longer. I just shoot in the natural light that my loft gives me. I have windows that are 12 feet wide by about 24 feet tall. They're covered with the "cellular" type shades, allowing for a really nice diffused natural light. I get nearly the same effect from this setup as when I drag everything out and do it the "right" way. Yeah, part of the problem is that I'm in a small apartment, and the only natural light I get comes in sideways in the evening. A part of me is surprised to only see one sword in that picture. 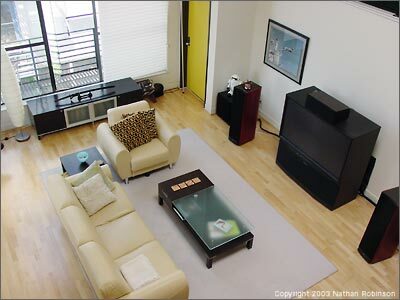 I guess you have the space to be tasteful about it though- my apartment looks much more cluttered. Out of curiousity, how do you store or display your swords? Well, when I had my last house--a four bedroom, two-story house in the 'burbs--I had a guest room decorated in a historical theme. We had swords and armour on the walls and a couple dress-forms with historic costumes mounted on them. Combine all this with some other artwork, and the room was just shy of being overboard... but, it was limited to that single room in the entire house. The door could be closed and the whole lot of it could be hidden away from view if desired. Now that I live in a loft, things are different. A loft is basically one very large room with some half-levels dividing the vertical space. In my case, it's about 1,300 square feet. There's not a lot of possibility of hiding things away and isolating areas. My interests are much too varied to want to have a single theme in the house, especially one involving swords and crap. I have far too much interest in design and other things like that to really want that to be the thing people immediately notice as they walk through the door. So, I have the swords piled up under the bed for the most part. I usually have a couple pulled out at any given point that I've been playing with.. cutting with.. polishing up.. or just admiring. The high-end pieces, like the Vince Evans piece and the Erik Stevenson schiavona are never stuffed under the bed, let alone piled anywhere. But I don't really display them. I'm not so into that. 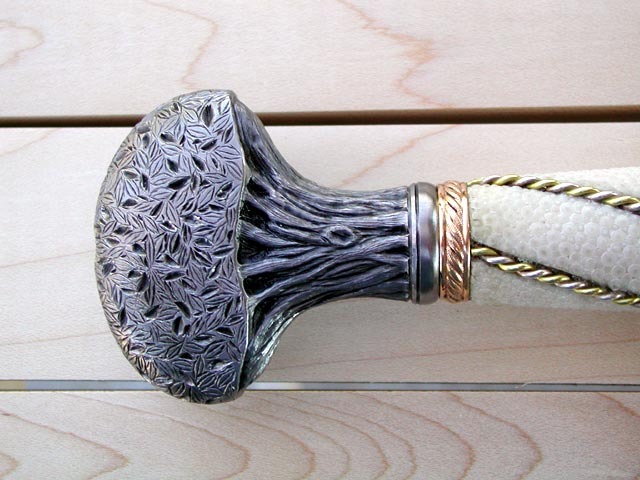 I'm interested in this hobby for the historic and artistic aspect of the sword as it pertains to how it was used, how it evolved, what influenced it, and how it was made. I don't really see it as a decorative element, personally. I really like your philosophy on sword collecting, Nathan. My home is good sized with lots of space and I used to have my swords virtually everywhere in the house, displayed in certain places for what I always thought was that "just right look" here and there. Over the years, however, as my collection began to grow a little, my interests in sword collecting evolved from buying and displaying them decoratively into very much the way you described. More an interest in how it was used, evolved, made and influenced and having something that, whether it is an original or a fine recreation, is a part of history. Since my interest in swords began to evolve in such a manner, a new fire of appreciation for all aspects of swords in general has enriched my enthusiasm and I find that, where I was once intrigued with only a few select swords, I'm now fascinated with all swords and cultures surrounding them and eager to learn more about them. Now most of my collection hangs on the walls in a spare 6x8 walk-in closet and I must confess that I do like the current arrangement much better now that my swords are no longer all over the place (but despite my wife's wishes for the house to be a sword-free environment, I suspect there'll always be those few special pieces that I just can't resist keeping proudly displayed). For what it's worth, here are few photo tips for museum shots. Tripods are almost always out of the question, but I've used a fully extended tripod with legs together to form a monopod without drawing complaints from security. A true monopod is better, but the least obtrusive support solution is an Ultrapod, a hand-size, rigid plastic folding tripod that is easily used a chest pod, with the short legs braced at collarbone level, the long leg braced against sternum and your left hand pressing the pod back into your chest. This works best on mid to large size cameras (the extra height and weight of the camera body helps,) and will let you effectively shoot down into the 1/15 sec range with a 50 1.8 and, say, 400 or 800 speed print film. Take a deep breath, exhale and at the end of the exhale very gently release the shutter. What an interesting thread! I was wondering however, about shooting outdoors. I ususally like to shoot as teh sun is going down behind some trees. Still whatwould you recommend about shooting during the day to remove glare and sky or tree refelctions? I shot some nice digital photos under my parent's open garage once at about 4PM CST. The light was perfect and I had no artifacts or reflections. I've found that overcast days are best for taking photos. This produces a nice diffused lighting without any shadows or glare. The last set of photos that I took for upcoming reviews were done in these conditions, and came out really well. In spite of working the night shift on Saturday I was up bright and early Sunday morning taking more photos because of the weather. I rolled over, looked out the window, saw the clouds, and was immeadiately jumping out of bed for a photo-op. Nathan keeps telling me that I need a digital camera, but it comes down to "sword or camera?" The most important tip is never use a flash with a digital camera, ever.